Roll-to-roll (R2R) manufacturing is an important manufacturing technology platform used extensively for mass-producing a host of film-type products in several traditional industries such as printing, silver-halide photography, and paper. Over the last two decades, some of the methodologies and know-how of R2R manufacturing have been extended and adapted in many new technology areas, including microelectronics, display, photovoltaics, and microfluidics. This comprehensive book presents the state-of-the-art unit operations of the R2R manufacturing technology, providing a practical resource for scientists, engineers, and practitioners not familiar with the fundamentals of R2R technology. Examines key elements (unit operations) of the R2R technology, and discusses how these elements are utilized and integrated to achieve desired process efficiencies in a host of applications. Illustrates several established and novel application areas where R2R processing is utilized in current or future products. Discusses process design methodology and key advantages of R2R manufacturing technology over batch or sheet-to-sheet operations. 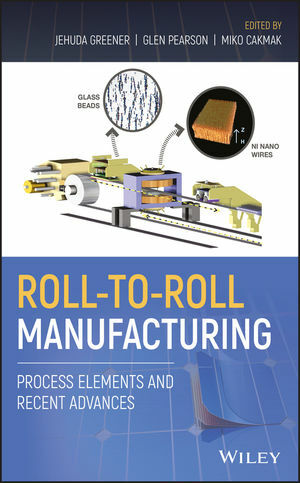 Roll-to-Roll Manufacturing: Process Elements and Recent Advances is an ideal book for undergraduate and graduate students in various science and engineering disciplines, as well as for scientists, engineers, and technical and business leaders associated in any way with the development, commercialization, and manufacture of a variety of film products. JEHUDA GREENER, PHD, formerly Research Fellow at Eastman Kodak and Distinguished Scientist and Technology Associate at Dow Chemical, is currently an independent consultant specializing in film technologies and polymeric materials and processes with emphasis on the display and microelectronics industries. GLEN PEARSON, PHD, formerly Director of the Manufacturing Research and Engineering Organization at Eastman Kodak, is currently Regional Director of FIRST (For Inspiration and Recognition of Science and Technology), a non-profit organization dedicated to inspire students about science, technology, engineering and math. MIKO CAKMAK, PHD, is the Reilly Chaired Professor of Materials and Mechanical Engineering at Purdue University. He is a recognized expert on processing structure, property relationships in polymers, and R2R metrology. He designed and developed several novel R2R lines for functional film production and associated metrology tools at the University of Akron and Purdue University.